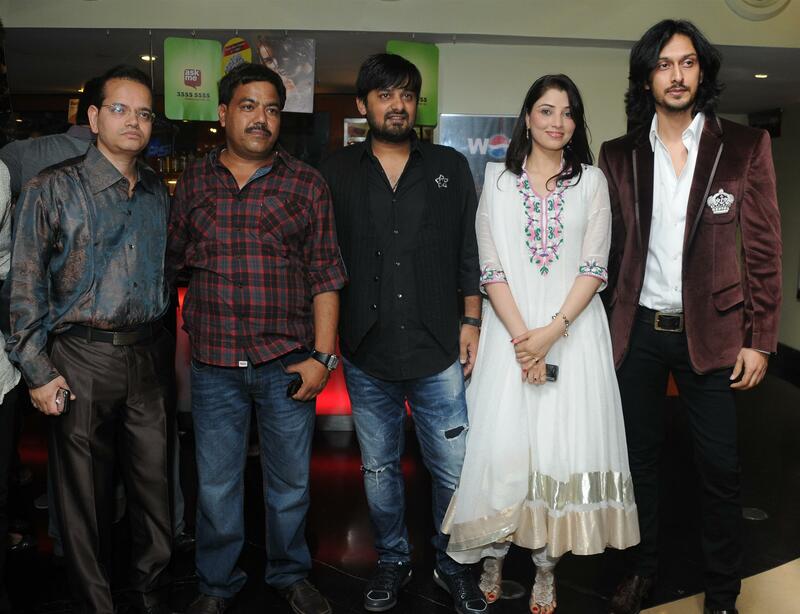 Pawan Goyal’s “Film Zindagi Tere Naam” premiere party was hosted at PVR cinema Juhu. Venus Worldwide Entertainment Pvt Ltd, brings yet another drama of Zindagi of love, Commitment and intense emotions in the film “ZINDAGI TERE NAAM”, and introducing Ranjeeta in her comeback avatar with her popular pair Mithun Chakraborty. Ashu Trikha is an Indian film director and producer of Bollywood. He started his career with Arjun Rampal movie Deewaanapan which was produced by Vashu Bhagnani movie is His second venture Baabarr had Mithun and Om Puri in lead roles. The film was critically acclaimed and done moderate business at the box-office. Now he is doing his third film Enemy with an ensemble cast of Mithun Chakraborty, Sunil Shetty, Mahakshay Chakra borty, Kay Kay Menon and Mahesh Manjrekar. Behind the Scenes of Ordinary Lives, you tend to uncover a “Zindagi” of love, commitment and intense emotion!!! Mr. Singh, an ordinary man with an ordinary life vividly recreates a legend, legend of love, life and romance se against fantastically different background of a couple, Siddharth and Anjali .The legend comes full circle from the green courts of Dalhousie to the studied manners of Chandigarh respectively!!! Two stories of romance run parallel right through and unfold to show the true emotions of couples. The intensity with which the couple loves is not limited by their respective ages. One has the youth, vibrancy and passion where as the other is studied, matured and sober but neither couples are short of intensity in their romance. It is a Classic example of how much you would do for your Love….! The entire drama unfolds from assignation to madness, From Love to Sunder, From Hope to Despair and from comeback to Tears. Without any revulsion they revel in it and without any fright they fight for it. It is believed that love is when forever is not long enough….! Zindagi Tere Naam is tale that has lives that will live for love and the sacrifice of hearts that will leave other hearts bleeding!! It is a Swan’s tale that will waive the ups and downs of the Love at its Zenith. A Story of Great Love, which will truly re-define” Love for Life “and that, is when we say “Zindagi Tere Naam”! Banner:-Pawan Goyal, Directed By :-Ashu Trikha, Produced By:-Shree Sai Pictures, Star Cast:- Mithun Chakraborthy, Ranjeeta, Assem Ali Khan, Priyanka Mehta, Ashish Sharma, Muisc By:-Sajid Wajid ,Singer:-Shaan, Sajid Khan, KK, Sunidhi Chauhan, Richa Sharma, Afzal Sabri, Shafaqat, Amanat Ali Khan. Media Consultant by Parul Chawla (Picture N Kraft). This entry was posted in Trending News and tagged -Pawan Goyal, Afzal Sabri, Amanat Ali Khan, Aseem Ali Khan, Ashish Sharma, Assem Ali Khan, Champak Jain, Directed By :-Ashu Trikha, Kay Kay Menon and Mahesh Manjrekar., KK, Mahakshay Chakra borty, Mithun Chakraborty, Muisc By:-Sajid Wajid, Priyanka Mehta, Produced By:-Shree Sai Pictures, Ranjeeta, Ranjeeta in her comeback avatar with her popular pair Mithun Chakraborty, Richa Sharma, sajid khan, Shafaqat, Singer:-Shaan, Star Cast:- Mithun Chakraborthy, Sunidhi Chauhan, Sunil Shetty, Wajid Ali, Zindagi Tere Naam premiere party.